Football at the University of Pittsburgh began in the fall of 1889 when the school was still known as the Western University of Pennsylvania, often referred to as WUP, and was located in what was then known as Allegheny City and is today the city of Pittsburgh's North Side. A 130-pound WUP student, Bert Smyers, along with senior student John Scott, assembled a football team that year composed of only three players who had previously witnessed the sport. The team played in one informal game, a loss against Shady Side Academy, in which Smyers made himself quarterback and Scott played center. In preparation for the following year, the first season of football officially recognized by the university, Smyers and his teammates took up a collection and purchased a football for practices and games; players were responsible for their own uniforms. In Smyers' case, his uniform was pieced together by his mother and sister. The first official game for the university was played on October 11, 1890, when the Allegheny Athletic Association's opponent, Shadyside Academy, failed to appear for its game at Exposition Park. Allegheny A.A. called Smyers who brought the WUP team as a replacement. In an inglorious start to Pitt football history, WUP was defeated 38–0. Smyers' team next faced Washington and Jefferson College, losing 32–0, but closed out its inaugural three game season with the university's first win, a 10–4 victory over Geneva College. The following season saw the university collect more losses en route to a 2–5 record. Smyers suffered a broken nose in a 40–6 loss to Washington and Jefferson, a school that would become one of WUP's fiercest early rivals. The WUP team did record the school's first shutout with a 6–0 win over Geneva, as well as the school's first blowout in a 54–0 win over Western Pennsylvania Medical College who became affiliated with WUP in 1892 and later became the university's medical school when they merged in 1908. Perhaps the most important development for the second season of football was Smyers recruitment of Joseph Trees from Normal University of Pennsylvania. The 210 pound Trees became WUP's first subsidized athlete and, later in life, made millions in the oil industry and became an important benefactor for the university and athletic department. Today, Trees Hall, an athletic facility on the University of Pittsburgh's main campus in the Oakland section of Pittsburgh, bears his name. The first winning record for the university came in the third season of competition in 1892, when the team posted a 4–2 record. The following season in 1893, the team had its first official coach, Anson F. Harrold, who led the team to an unremarkable 1–4 record. However, during that season the first contest was played in what would become a 96-game series versus Penn State, thus originating one of the longest and fiercest rivalries for both schools. In 1895, the school suffered a 1–6 season under coach J.P. Linn. The 1895 season was notable for the first Backyard Brawl on October 26, 1895, with WUP losing to West Virginia 8–0 in Wheeling, West Virginia. The university did not see another winning season until Fred Robinson led WUP to a 5–2–1 record in 1898. In 1899, Robinson continued his success with a 3–1–1 record, giving the school its first back-to-back winning seasons. This was followed by two more consecutive winning seasons, including a record seven-win season in 1901 under coach Wilbur Hockensmith. That season, Hockensmith led the school to its first victory over West Virginia, a 12–0 shutout in Morgantown on October 5, 1901. In the early years of the 20th century, interest in college football grew both in Pittsburgh and throughout the nation. In 1903, Arthur St. Leger "Texas" Mosse was hired away from the University of Kansas, and brought several of his players with him. Other players were recruited from surrounding Western Pennsylvania colleges, including star half back Joseph H. Thompson. The 1903 season, the first under Mosse, was the university's first winless season at 0–9–1. [n 1] In perhaps one of the greatest turnarounds in college football history, Mosse led WUP to an undefeated 10–0 season, the school's first, in 1904. The 1904 team surrendered only one touchdown on the way to collectively outscoring opponents 406–5. That season also saw the school's first victory over Penn State, a 22–5 rout, as well as a 53–0 shutout of West Virginia. [n 2] The success of this period can be partially attributed to actions taken by the university's administration, led by newly installed chancellor Samuel McCormick who took special interest in athletics at the university. Encouraged by university trustee George Hubberd Clapp, the administration more actively engaged in supporting the athletic program during this period in order to promote the university. A football association was formed, the school's first booster organization, whose largest initial contributor was Andrew W. Mellon. The university also obtained a lease of Exposition Park to give the football team a more stable and permanent home, and its first full season at the park began with the 1904 undefeated team. This undefeated 1904 season was followed by a 10–2 record under Mosse in 1905, as well as six additional winning seasons. Thompson coached at Pitt until 1912, the longest tenure of any coach to that point, and led the football team to a 22–11–2 record. The highlight of his coaching tenure was the 1910 season in which Pitt, led by star fullback Tex Richards, went undefeated for the second time in school history. Of even greater significance, the 1910 team was unscored upon, collectively outscoring its 9 opponents 282–0, and is considered by many to be that season's national champion. Following his coaching stint, Thompson went on to become a highly decorated hero of World War I. Winning continued under coach Joseph Duff, including an 8–1 record in 1914 in which opponents were collectively outscored 207–38, and the university was well on the way to establishing itself as a regional, if not yet national, power. Duff would leave the Panthers after two seasons to serve in World War I, where he would be killed in combat in October 1918. In 1914, Pitt athletic booster Joseph Trees and athletic director A. R. Hamilton hired Glenn Scobey "Pop" Warner as Pitt's head coach. Warner, who had previously led Carlisle, Cornell, and Georgia, had been successful at his previous stops, mentoring the likes of Jim Thorpe, and was known as an innovator of the game who originated the screen pass, single- and double-wing formations, and use of shoulder and thigh pads. His arrival at Pitt gave the program instant national credibility, lifting the perception of the program from a regional power to that of a national one. Warner's impact was immediate. Led by center Robert Peck, Pitt's first First Team All-American, and All-American end James Pat Herron, Warner's first Pitt team in 1915 went 8–0, shutting out five opponents, and was trumpeted by football historian Parke H. Davis as that season's national champion. His second season duplicated that success, repeating an 8–0 record while collectively outscoring opponents 255–25, and garnering what is widely regarded as a consensus national championship. The lone scare of the 1916 season occurred at Navy when, following a delay of the team's train heading to Annapolis that caused a late arrival, the team overcame several fumbles and eked out a 20–19 victory. The 1916 team was led again by Herron and Peck, now in his last season, as well as All-Americans fullback Andy Hastings and guard "Tiny" Thornhill. Also on that team were Jock Sutherland and H.C. "Doc" Carlson, who both would garner First Team All-American selections while members of the undefeated 1917 team, and go on to become perhaps Pitt's most legendary coaches in football and basketball, respectively. The 1917 team, nicknamed "The Fighting Dentists" because over half the roster became doctors or dentists, finished 10–0 with five shutouts despite losing several players to military service at the outbreak of World War I. The Spanish flu pandemic of 1918, which took the life of former Pitt star Tex Richards, saw the implementation of quarantines that eliminated much of that year's college football season, including five of Pitt's originally scheduled contests. All of Pitt's games that year were played in November, including a high-profile game played as a War Charities benefit against undefeated, unscored upon, and defending national champion Georgia Tech, coached by the legendary John Heisman. Pitt swept through its first two games and then dismantled Georgia Tech 32–0 in front of many of the nation's top sports writers including Walter Camp. The final game of the season at Cleveland Naval Reserve resulted in Warner's first loss at Pitt and is one of the most controversial in school history. Warner, along with some reporters covering the game, insisted Pitt was robbed by the officials who, claiming the official timekeeper's watch was broken, arbitrarily ended the first half before Pitt was able to score and then allowed the Reserves extra time in the fourth quarter to pull ahead 10–9 before calling an end to the game. Despite the loss, the 4–1 Panthers of 1918 were named by multiple selectors as a national champion for that season. Prior to the 1922 season, Warner announced he was leaving Pitt to take the head coaching position at Stanford, but he honored his contract and remained at Pitt through 1923. 1922 resulted in an 8–2 record, and the season ended on a high note when the Panthers took their first cross-country trip, by train, to defeat Stanford, coached by two Pitt assistants sent ahead by Warner, 16–7 at Stanford. Warner's final season was his worst at Pitt as the Panthers stumbled to a 5–4 record in 1923. However, the Warner era at Pitt closed on a high note with a 20–3 victory over Penn State on November 29. In all, Warner coached his Pitt teams to 33 straight wins and three national championships (1915, 1916 and 1918). He coached Pittsburgh from 1915 to 1923 to a combined 60–12–4 record. Importantly, Warner helped raise the interest in Pitt football to the point where the university sought to build an on-campus stadium with increased seating capacity that would be dedicated to the football team, and the school began taking steps to secure the necessary land and funds to build Pitt Stadium. A natural replacement for Warner was Dr. John Bain "Jock" Sutherland, Warner's former All-American guard on the 1915 and 1916 national championship teams and 1917 undefeated team. A native of Coupar Angus in Scotland, Sutherland had graduated from the University of Pittsburgh's School of Dentistry, where he later served as faculty. Sutherland had served a tour in the Army and later achieved success as the head coach of Lafayette College from 1919 to 1923, leading the Leopards to the 1921 Eastern Collegiate Championship and shutting out Warner's Pitt teams in 1921 and 1922. So it was in 1924 that Sutherland returned to his alma mater to assume the head coaching duties with the goal of constructing dominant teams built on power and speed. After a 5–3–1 record in his first season, Sutherland's second season kicked off the Panthers' first in the newly constructed Pitt Stadium and saw the team achieve an 8–1 record and win the 1925 Eastern Championship. The following year, the Panthers featured Gibby Welch, who led the nation in rushing in 1926 and helped Pitt to the Eastern Championship and its first bowl game, the Rose Bowl, in 1927. Pitt, ironically, lost the Rose Bowl 7–6 to a Stanford team headed by the Panthers' former coach, "Pop" Warner. In 1929, Pitt went undefeated in the regular season, the first of four undefeated regular seasons under Sutherland, and won the Eastern Championship, but lost its second appearance in the Rose Bowl to USC. Bowls at the time were still considered by many to be exhibition games, and the loss did not prevent football historian Parke Davis from naming Pitt as that season's national champion. One of the greatest back-to-back stretches in Pitt football history occurred during the 1936 and 1937 seasons which featured Heisman Trophy candidate and Hall of Fame running back Marshall Goldberg. In 1936, Pitt shut out five of its opponents, including a 34–0 win over West Virginia, a 6–0 victory at Ohio State, and a 26–0 win over Notre Dame in which the Irish did not achieve a first down until late in the third quarter. The Panthers also won at Nebraska 19–6 and defeated Penn State 24–7. Only the second of three consecutive scoreless ties at the Polo Grounds against Fordham, and a mid-October 7–0 upset loss against crosstown rival Duquesne, marred the record. The Panthers finished the regular season winning the Lambert-Meadowlands Trophy as Eastern Champions and ranked third in the Associate Press Poll, the inaugural year of the poll, whose rankings were finalized before the bowl season. Pitt accepted a bid to the Rose Bowl to face Washington, and this time Sutherland was determined not to lose again out west. To avoid subpar play following the cross country train trip, Sutherland took his team out two weeks early to allow for adequate preparation. These moves paid off with a 21–0 rout of Washington which led many selectors to name Pitt as the 1936 national champions. However, it was during this time that the seeds of a rift between Sutherland and the university's administration were being sown, partly initiated by the refusal of the university to supply pocket money for players during the Rose Bowl trip, which Sutherland then decided to supply out of his own pocket. Pitt followed up the Rose Bowl winning 1936 season with a 9–0–1 record in 1937 that included five shutouts, including those over West Virginia, Wisconsin, and at Duke as well as additional victories against Penn State, Nebraska, and at Notre Dame. The only blemish on the record was the third consecutive tie at Fordham, which resulted when an apparent winning touchdown by Pitt's Marshall Goldberg was called back on a holding penalty. Pitt finished the 1937 regular season as repeat Eastern Champions and was ranked number one in the AP's final poll. Partly due to the developing rift with the university administration, and also due to the time and expense of the travel, Pitt became the first team to publicly decline a Rose Bowl invitation following a vote of the players. Despite its decision to sit out the postseason, the 1937 Pitt team was widely regarded as consensus national champions. Len Casanova took the Pitt job in 1950 but a disastrous campaign was followed by his departure following spring practice in 1951. This led to athletic director Tom Hamilton taking the reins of the team on an interim basis for the 1951 season. In 1952 Red Dawson took over, and the Panthers, led by future Hall of Famer Joe Schmidt, scored a huge upset at Notre Dame, then coached by Frank Leahy, en route to a 6–3 record. However, a losing record followed in 1953, and after three losses to start the 1954 season, and due to poor health, Dawson stepped down. For the remainder of the season Hamilton again took over the team, guiding Pitt to an upset of number nine Navy and handing West Virginia its only loss of the season. University Chancellor Wesley Posvar took action to revive the football program and hired Johnny Majors from Iowa State to resurrect the program in 1973. Majors immediately upgraded the recruiting, most notably bringing in future Heisman Trophy winner Tony Dorsett. Majors' impact was immediate: in Pitt's first game with Majors as coach, the Panthers travelled to the University of Georgia where they tied Vince Dooley's Bulldogs 7–7. The excitement in the city was palpable as the Panthers improved from one win in 1972 to a 6–5–1 record in 1973. Their success earned the Panthers their first bowl bid since 1956 when they were invited to play Arizona State in the 1973 Fiesta Bowl, where they lost 28–7. The next season saw further improvement with wins at Florida State and Georgia Tech to finish 7–4. In 1975, a Sun Bowl victory over Kansas capped an 8–4 record highlighted by wins at Georgia and against Notre Dame. The stage was thus set for the 1976 edition of the Panthers to make a run for the national championship. On December 16, 2010, Miami (OH) head coach Mike Haywood was introduced as Wannstedt's replacement as head coach. At his introductory press conference, athletic director Steve Pederson said Haywood was "a man of integrity and character and will be a true inspirational leader for our football team." However, Haywood's arrest on domestic violence charges in South Bend, Indiana on December 31, two weeks and two days later, prompted Pitt to fire him immediately. Haywood never coached a game, recruited a player, led a practice or even hired an assistant coach at Pitt. His sixteen-day tenure at Pitt is the second shortest in FBS history (only to George O'Leary's five-day tenure at Notre Dame). Despite the turmoil, Bennett led the Panthers to a 27–10 bowl victory over Kentucky on January 8, 2011. On December 22, 2011, Wisconsin offensive coordinator Paul Chryst was introduced as the head coach and lead the Panthers in their final season of the Big East which included another appearance in the BBVA Compass Bowl and a 6–7 final record. Chryst's hiring made him the Panthers' fourth head football coach since December 2010 (sixth counting interims). Chryst led Pitt into the Atlantic Coast Conference where the program competed in the conference's Coastal Division during the 2013 season. The Panthers again posted a 6–6 record in the 2013 regular season and accepted an invitation to the Little Caesars Pizza Bowl, where they defeated Bowling Green 30–27. On December 17, 2014, Chryst was announced as the new head coach at Wisconsin; athletic director Steve Pederson was fired on the same day as Chryst's departure. On December 17, 2014 Joe Rudolph was named interim coach for the Armed Forces Bowl against the University of Houston. On December 26, 2014; Michigan State defensive coordinator Pat Narduzzi was named the 37th Pitt head coach. Although he didn't have any head coaching experience, Narduzzi was regarded as one of the country's best defensive minds and assistant coaches who had recruiting strong ties to the northern United States and, specifically, east Ohio and west Pennsylvania. Pittsburgh signed Narduzzi to a five-year contract. Pitt went 8–5 in 2015. The Panthers began the Narduzzi era on September 5 with a 45–37 victory over FCS opponent Youngstown State. Pittsburgh won their second game of the season the following week, defeating Akron by a score of 24–7. After a 27–24 loss to Iowa, Narduzzi's squad defeated Virginia Tech by a margin of 17–13. In the season's fifth game, the Panthers defeated Virginia by a score of 26–19. A third straight win came on October 17 with a 31–28 victory over Georgia Tech. After a 23–20 victory over Syracuse, Pittsburgh suffered its second defeat of the season with a 26–19 loss to North Carolina. On November 7, Narduzzi's Panthers lost to #8 Notre Dame by a score of 42–30. That was followed by a 31–13 victory over Duke. After a 45–34 victory over Louisville, Pitt fell to Miami in the regular season finale by a score of 29–24. The Panthers accepted an invitation to the Military Bowl, where they lost to #21 Navy by a margin of 44–28. During the 2015 season, Pitt was ranked in the AP top 25 for the first time since 2010. Narduzzi's first full recruiting class, in 2016, was ranked 30th in the country, Pitt's highest ranked class since 2008. On December 10, 2015; Pitt signed Narduzzi to a two-year contract extension and raised his pay. The Panthers finished with another 8–5 record in 2016. In the season opener, they defeated in-state FCS opponent Villanova by a score of 28–7. After a 42–39 victory over archrival Penn State, Pittsburgh suffered their first loss of the season, dropping a 45–38 contest to Oklahoma State. After a nailbiting 37–36 loss to North Carolina, Narduzzi's team won a 43–27 contest over Marshall on October 1. A second straight win followed one week later when the Panthers defeated Georgia Tech by a margin of 37–34. Narduzzi's squad won a third straight game On October 15 when they defeated Virginia by a score of 45–31. Pittsburgh then suffered consecutive defeats, falling to #25 Virginia Tech by a margin of 39–36 and Miami by a score of 51–28. On November 12, the Panthers traveled to Clemson, South Carolina and knocked off #3 Clemson by a score of 43–42 on a late field goal. Pitt followed that huge upset victory with a 56–14 blowout win over Duke and a high-scoring 76–61 shootout victory over Syracuse to finish the regular season. Pittsburgh accepted an invitation to the Pinstripe Bowl, a game they lost to Northwestern by a score of 31–24. Pittsburgh slipped to a 5–7 record in 2017. The Panthers kicked off the season on September 2, defeating FCS Youngstown State in overtime by a score of 28–21. One week later, Pitt lost the Keystone Classic to archrival #4 Penn State by a margin of 33–14. In the season's third game, Narduzzi's squad lost its second straight contest with a 59–21 defeat at the hands of #9 Oklahoma State. After a 42–10 victory over Rice, the Panthers lost another two straight; falling to Syracuse by a margin of 27–24 and #20 NC State by a score of 35–17. Pitt then won their next two; defeating Duke by a margin of 24–17 and Virginia by a score of 31–14. After a 34–31 loss to North Carolina and a 20–14 defeat to #17 Virginia Tech knocked the Panthers out of bowl contention, Narduzzi's team finished the season with a big upset victory, stunning #2 Miami by a score of 24–14. On December 6, 2017, the University of Pittsburgh administration signed Narduzzi to another contract extension and raise, extending his deal by seven years. 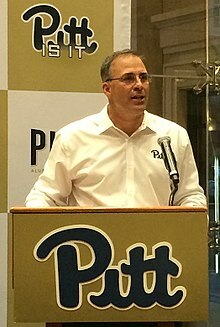 Narduzzi led Pitt to its first ACC Coastal Division Championship in 2018. Pittsburgh has two conference championships. Pittsburgh has one division championship. Pitt has been to 34 bowl games throughout its history, winning 13 and losing 21. The upper section of the Cathedral of Learning has been illuminated gold with "victory lights" after a football team victory since 1983. During home games, the jumbotron leads the crowd in a "Let's Go Pitt!" version of "Sweet Caroline", originally played between the 3rd and 4th quarter, but more recently at random times during games. During away games the Pitt Band will lead the visitor Pitt fans in a rendition of the song. For most of Pitt's football history its chief rival had been in-state foe Penn State. The first Pitt-Penn State game was played in 1893. The game has been played 97 times, with Penn State holding a 51–43–4 edge in the series. After a 16-year hiatus that occurred because of a well-documented refusal of Joe Paterno to resume the series the rivalry was renewed following his death in 2012 and resumed with a 42-39 Pitt victory on September 10, 2016. Pitt has had 76 different players selected as First Team All-American throughout its history for a total of 92 all-time First Team All-American Selections. That total includes 51 selections which have attained Consensus status. Pitt's Consensus First Team selections ranks as the twelfth most consensus All-Americans among Division I FBS schools. The following list of Pitt's First Team All-Americans is compiled for the Pitt football media guide from various sources including the NCAA Football Guide, and consists of players who were first-team selections on one or more of the All American teams which were made over the years by Walter Camp, Grantland Rice, Caspar Whitney, International News Service, Associated Press, United Press International, NANA, NEA, the Football Writers Association of America, the Football Coaches Association, the All-America Board, Newsweek, The Sporting News, and Sports Illustrated. Through the 2018 NFL season, 33 former Pitt players have been selected to appear in the NFL Pro Bowl for a total of 122 all-time Pro Bowl selections. Pitt has been represented by at least one Pro Bowl selection every year since 1981. Throughout its history, the University of Pittsburgh has had 269 players selected 290 times in professional football drafts when totaling both NFL and AFL picks. This includes 25 First Round NFL draft picks since 1960. #Selected to the Pro Bowl. &transferred to the University of Delaware for his final two seasons. ^ The University of Pittsburgh's football media guide does not list a 10–6 loss to Duquesne University for the 1903 season, although it appears in the Duquesne football media guide and on College Football Data Warehouse. Therefore, the Pitt football media guide lists the record for the 1903 season as 0–8–1, and Mosse's overall record at the university as 20–10–1. College Football Data Warehouse, whose numbers are used in this article, lists Mosse's 1903 record as 0–9–1, and his overall Pitt record as 20–11–1. ^ Various sources list the score of the 1904 Penn State win as 24–5, 23–5, and 22–5. The score of 22–5 from the Courant, a monthly student journal of the Western University of Pennsylvania, is identical to how the score is listed at College Football Data Warehouse, and when used to calculate the total season points scored, matches the total listed above as reported in the book Pitt: The Story of the University of Pittsburgh 1787–1987: 406–5. ^ a b The Official NCAA Records Book credits Washington & Jefferson as being the first documented college football team to use uniform numbers. ^ According to Sports Illustrated, Pitt was selected as a national champion in 1934 by Parke Davis, or someone using his byline. Davis is deemed as a "major selector" of national champions according to the Official NCAA Records Book. However, Davis' championship selection for 1934, reported by Sports Illustrated, is missing from the Official NCAA Records Book, and thus Pitt is listed in the NCAA Records Book as having been named a national champion by a "major selector" in only 11, and not 12, seasons. ^ a b The total of 17 national championship season selections is arrived at by combining the 16 seasons listed by College Football Data Warehouse plus the 1934 Parke Davis selection listed by Sports Illustrated and claimed by Pitt. Cite error: Invalid <ref> tag; name "17NC" defined multiple times with different content (see the help page). ^ Based on a Sports Illustrated study conducted in 1970. ^ National Championships as listed in the Official NCAA Football Records Book as selected by "Major Selectors". The NCAA itself does not recognize or discriminate between national championship selections. ^ The University of Pittsburgh officially claims 9 national championships for the Panthers football team. The University of Pittsburgh bases its claim for the first 8 national championships on a study conducted in 1970 by Sports Illustrated. These championships, together with its unanimous championship of 1976, are the basis for the university's claim of 9 national championship seasons. ^ Borghetti, E.J. ; Feeley, Ted; Welsh, Celeste; et al., eds. (July 19, 2014). 2014 Pitt Football Media Guide (PDF). University of Pittsburgh Athletic Media Relations Office. pp. 118–119. Retrieved May 17, 2015. ^ Color Palette (PDF). Pitt Athletics Brand Identity Manual. April 9, 2019. Retrieved April 10, 2019. ^ a b c d e f g h i Borghetti, E.J. ; Nestor, Mendy; Welsh, Celeste, eds. (2008). 2008 Pitt Football Media Guide (PDF). University of Pittsburgh. p. 156. Retrieved 2010-07-07. ^ "Division I-A All-Time Wins". College Football Data Warehouse. Archived from the original on 2009-01-22. Retrieved 2009-03-15. ^ "National Football Foundation's College Football Hall of Fame: Hall of Famers,". Archived from the original on 2003-12-21. Retrieved 2009-03-15. ^ a b 2012 NCAA Football Records Book (PDF). Indianapolis: National Collegiate Athletic Association. 2012. p. 18. Retrieved May 9, 2014. ^ a b c "Hall of Famers by College". Pro Football Hall of Fame. Retrieved 2012-02-04. ^ Sciullo Jr., Sam (2008). University of Pittsburgh Football Vault: The History of the Panthers. Atlanta: Whitman Publishing. p. 7. ISBN 0-7948-2653-9. ^ Sciullo Jr., Sam (2008). University of Pittsburgh Football Vault: The History of the Panthers. Atlanta: Whitman Publishing, LLC. p. 8. ISBN 0-7948-2653-9. ^ a b c d Borghetti, E.J. ; Nestor, Mendy; Welsh, Celeste, eds. (2008). 2008 Pitt Football Media Guide (PDF). University of Pittsburgh. p. 148. Retrieved 2009-04-08. ^ Starrett, Agnes Lynch (1937). Through one hundred and fifty years: the University of Pittsburgh. University of Pittsburgh Press. p. 355. ^ Sciullo Jr., Sam (2008). University of Pittsburgh Football Vault: The History of the Panthers. Atlanta: Whitman Publishing. p. 9. ISBN 0-7948-2653-9. ^ Sciullo Jr., Sam (2008). University of Pittsburgh Football Vault: The History of the Panthers. Atlanta: Whitman Publishing. p. 12. ISBN 0-7948-2653-9. ^ Duquesne Football 2008 Media Guide (PDF). 2008. p. 45. Retrieved 2009-02-18. ^ "Coaching Records Game by Game: Arthur St. L. "Texas" Mosse: 1903". College Football Data Warehouse. Retrieved 2009-02-18. ^ a b Alberts, Robert C. (1986). Pitt: The Story of the University of Pittsburgh 1787–1987. University of Pittsburgh Press. p. 65. ISBN 0-8229-1150-7. Retrieved 2009-02-18. ^ The Owl. Junior Class of the Western University of Pennsylvania. 1907. p. 261. Retrieved 2010-06-02. ^ "School News". Courant. Western University of Pennsylvania. 20 (3): 21. December 1904. Retrieved 2009-02-19. ^ "Coaching Records Game by Game: 1904". College Football Data Warehouse. Retrieved 2009-02-18. ^ Sciullo Jr., Sam (2008). University of Pittsburgh Football Vault: The History of the Panthers. Atlanta: Whitman Publishing. p. 13. ISBN 0-7948-2653-9. ^ Sam Sciullo; Sam Sciullo, Jr. (2004). Tales from the Pitt Panthers. Sports Publishing LLC. ISBN 1-58261-198-X. ^ a b Sullivan, George (2004). Any Number Can Play: The Numbers Athletes Wear. Millbrook Press. p. 13. ISBN 0-7613-1557-8. ^ a b Murphy, Arthur (1959-09-28). "Memo From The Publisher". Sports Illustrated: 15. Archived from the original on 2012-12-06. ^ "College Football Rules Changes – Equipment" (PDF). Football Bowl Subdivision Records. National Collegiate Athletic Association. 2009. p. 130. Archived from the original (PDF) on 2010-06-02. Retrieved 2010-06-02. ^ The Owl. University of Pittsburgh. 1911. Retrieved 2009-03-31. ^ "Yearly National Championship Selections". www.cfbdatawarehouse.com. ^ Sciullo Jr., Sam (2008). University of Pittsburgh Football Vault: The History of the Panthers. Atlanta: Whitman Publishing. p. 25. ISBN 0-7948-2653-9. ^ "Yearly National Championship Selections". www.cfbdatawarehouse.com. Archived from the original on 2012-11-14. ^ Sciullo Jr., Sam (2008). University of Pittsburgh Football Vault: The History of the Panthers. Atlanta: Whitman Publishing. pp. 28–29. ISBN 0-7948-2653-9. ^ "Robert W. Richards Pneumonia Victim", Eagle, November 8, 1918. ^ Keck, Harry (November 30, 1918). "Navy Reserves Steal Game From Pitt". Pittsburgh Sunday Post. Nashville, Tennessee: Athlon Sports Communications: 33. ISBN 1-878839-04-7 – via The Greatest Moments in Pitt Football History (1994). ^ Sciullo Jr., Sam (2008). University of Pittsburgh Football Vault: The History of the Panthers. Atlanta: Whitman Publishing. p. 36. ISBN 0-7948-2653-9. ^ "College Football Data Warehouse: Yearly National Championship Selections: 1918 National Champions". Retrieved 2009-04-08. ^ a b Sciullo Jr, Sam, ed. (1991). 1991 Pitt Football: University of Pittsburgh Football Media Guide. University of Pittsburgh Sports Information Office. p. 116. ^ "Pitt Pittsburgh – PittsburghPanthers.com – Official Athletic Site of the University of Pittsburgh". www.cstv.com. ^ Sciullo Jr., Sam (2008). University of Pittsburgh Football Vault: The History of the Panthers. Atlanta: Whitman Publishing. p. 41. ISBN 0-7948-2653-9. ^ Sciullo Jr., Sam (2008). University of Pittsburgh Football Vault: The History of the Panthers. Atlanta: Whitman Publishing. p. 47. ISBN 0-7948-2653-9. ^ Daley, Arthur J. (October 20, 1934). "Minnesota Trickery Dooms Panthers". The New York Times. Nashville, Tennessee: Athlon Sports Communications: 42. ISBN 1-878839-04-7 – via The Greatest Moments in Pitt Football History, 1994. ^ a b c d e f Jenkins, Dan (September 11, 1967). "This Year The Fight Will Be In The Open". Sports Illustrated. Chicago. 27 (11): 30–33. Retrieved 2016-02-08. ^ "Alabama Football 2003" (PDF). Tuscaloosa, Alabama: University of Alabama. 2003: 248–249. Archived from the original (PDF) on 2012-07-14. Retrieved 2009-04-08. ^ "College Football Data Warehouse: Yearly National Championship Selections: 1936 National Champions". Archived from the original on 2010-02-11. Retrieved 2009-04-08. ^ Beachler, Eddie (1982). "Panthers Became National Power on Single Wing During Torrid '30s". In O'Brien, Jim. Hail to Pitt: A Sports History of the University of Pittsburgh. Pittsburgh: Wolfson Publishing Co. p. 59. ISBN 0-916114-08-2. ^ Devold, Harry (September 29, 1987). ""Dream Backfield" put Pitt in National Spotlight". The Football News, republished in the Greatest Moments in Pitt Football History (1994). Nashville, Tennessee: Athlon Sports Communications: 59. ISBN 1-878839-04-7. ^ Sciullo Jr., Sam (2004). Tales From the Pitt Panthers. Champaign, Illinois: Sports Publishing LLC. p. 59. ISBN 1-58261-198-X. Retrieved 2009-04-10. ^ "College Football Data Warehouse: Yearly National Championship Selections: 1937 National Champions". Retrieved 2009-04-08. ^ Sciullo Jr., Sam (2008). University of Pittsburgh Football Vault: The History of the Panthers. Atlanta: Whitman Publishing. p. 49. ISBN 0-7948-2653-9. ^ Wallace, Francis (October 28, 1939). "Test Case at Pitt". The Saturday Evening Post, republished in the Greatest Moments in Pitt Football History (1994). Nashville, Tennessee: Athlon Sports Communications: 61. ISBN 1-878839-04-7. ^ Alberts, Robert C. (1986). Pitt: The Story of the University of Pittsburgh 1787–1987. University of Pittsburgh Press. p. 165. ISBN 0-8229-1150-7. Retrieved 2008-08-26. ^ Sciullo Jr., Sam (2008). University of Pittsburgh Football Vault: The History of the Panthers. Atlanta: Whitman Publishing. p. 55. ISBN 0-7948-2653-9. ^ Daley, Arthur (October 29, 1938). "Pitt Finally Defeats Fordham". The New York Times. Nashville, Tennessee: Athlon Sports Communications: 55. ISBN 1-878839-04-7 – via The Greatest Moments in Pitt Football History (1994). ^ Wallace, Francis (November 24, 1939). "The Football Factory Explodes". The Saturday Evening Post, republished in the Greatest Moments in Pitt Football History (1994). Nashville, Tennessee: Athlon Sports Communications: 73. ISBN 1-878839-04-7. ^ Alberts, Robert C. (1986). Pitt: The Story of the University of Pittsburgh 1787–1987. University of Pittsburgh Press. p. 167. ISBN 0-8229-1150-7. Retrieved 2008-08-26. ^ Alberts, Robert C. (1986). Pitt: The Story of the University of Pittsburgh 1787–1987. University of Pittsburgh Press. p. 158. ISBN 0-8229-1150-7. Retrieved 2008-08-26. ^ a b c University of Pittsburgh 1975 football media guide. University of Pittsburgh. 1975. p. 54. Retrieved 2008-08-26. ^ Wallace, William N. (1994-10-15). "COLLEGE FOOTBALL; This Pitt Backfield Is Still a Dream". The New York Times. Retrieved 2008-08-26. ^ a b 2007 Pitt Football Media Guide (PDF). p. 176. Retrieved 2008-08-26. ^ Sciullo Jr., Sam (2004). Tales from the Pitt Panthers. Champaign, Illinois: Sports Publishing L.L.C. pp. 9–10. ISBN 1-58261-198-X. Retrieved 2009-09-13. ^ "Conference May Demand New Entry". Pittsburgh Post-Gazette. 1939-12-25. Retrieved 2009-12-15. ^ Byers, Walter; Hammer, Charles (1997). Unsportsmanlike Conduct: Exploiting College Athletes. University of Michigan Press. p. 44. ISBN 0-472-08442-9. Retrieved 2009-12-15. ^ Eldridge, Jr., Larry; Venzon, Linda, eds. (1989). 1989 Pitt Football University of Pittsburgh Football Media Guide. University of Pittsburgh. p. 92. ^ a b Thamel, Pete (2006-01-01). "Grier Integrated a Game and Earned the World's Respect". New York Times. Retrieved 2009-04-15. ^ Gorman, Kevin (2008-10-30). "Pitt-Notre Dame series produces phenomenal performances". Pittsburgh Tribune-Review. Archived from the original on 2013-01-04. Retrieved 2010-04-29. ^ Associated Press (1976-10-24). "Tony Dorsett No. 1". Reading Eagle. p. 77. Retrieved 2010-05-01. ^ Mackin, Mike (2008-06-12). "Let's Learn From the Past: The 1976 Pitt Panthers". Pittsburgh Post-Gazette. Retrieved 2010-04-29. ^ "Yearly National Championship Selections: 1976 national championships". College Football Data Warehouse. Archived from the original on 2007-11-09. Retrieved 2009-04-15. ^ Fitzgerald, Francis J., ed. (1996). The Year the Panthers Roared. Louisville, Kentucky: AdCraft Sports. ISBN 1-887761-06-3. ^ Sciullo Jr., Sam (2004). Tales From the Pitt Panthers. Champaign, Illinois: Sports Publishing LLC. pp. 110–111. ISBN 1-58261-198-X. Retrieved 2009-04-10. ^ Sciullo Jr., Sam (2004). Tales From the Pitt Panthers. Champaign, Illinois: Sports Publishing LLC. pp. 37–39. ISBN 1-58261-198-X. Retrieved 2009-04-10. ^ Smizik, Bob (2000-11-02). "Smizik: 1980 Panthers rank among best". Pittsburgh Post-Gazette. Retrieved 2009-04-15. ^ Jr, GORDON S. WHITE (29 September 1982). "TEXAS A&M SIGNS SHERRILL TO RICHEST COLLEGE PACT" – via select.nytimes.com. ^ Zeise, Paul (2008-12-06). "No. 9 has special meaning for Panthers". Pittsburgh Post-Gazette. Retrieved 2009-04-15. ^ Gottfried, Mike; Benson, Ron (2007). Coach's Challenge: Faith, Football, and Filling the Father Gap. New York: Simon and Schuster. pp. 197–198. ISBN 1-4165-4355-4. Retrieved 2009-04-10. ^ Robinson, Alan (1989-12-19). "Pitt brass tells why Gottfried was fired". Associated Press. ^ Anderson, Shelly (2007-06-12). "Johnny Majors returning to his home again – in Tennessee". Pittsburgh Post-Gazette. Retrieved 2009-04-15. ^ Gorman, Kevin (2007-12-01). "Pederson returns at Pitt AD". Pittsburgh Tribune-Review. Archived from the original on 2007-12-02. Retrieved 2012-04-28. ^ "Pitt gets it right with Pederson's return". ^ a b Fittipaldo, Ray (2011-06-14). "Pitt, Penn State to renew football rivalry in 2016". Pittsburgh Post-Gazette. Retrieved 2011-06-14. ^ Cook, Ron (2008-09-28). "Harris not bitter over days at Pitt". Pittsburgh Post-Gazette. Retrieved 2009-04-15. ^ Zeise, Paul (2005-04-15). "Pittsburgh is gone, Pitt back as Panthers unveil different football uniforms, logo". Pittsburgh Post-Gazette. Retrieved 2009-04-15. ^ "Football Recruiting: Team Rankings 2006". Scout.com. 2006-02-28. Retrieved 2010-01-13. ^ "Football Recruiting: Team Rankings 2007". Scout.com. 2007-02-28. Retrieved 2010-01-13. ^ "Pitt throws curveball at BCS with win over No. 2 WVU". Morgantown, West Virginia. Associated Press. 2007-12-01. Retrieved 2009-04-15. ^ Associated Press (2010-12-07). "Dave Wannstedt resigns at Pitt". ESPN.com. Retrieved 2010-12-16. ^ a b "Pittsburgh hires Haywood as new head coach". ESPN.com. 16 December 2010. ^ "Pitt fires coach facing domestic violence charge". ESPN.com. 1 January 2011. ^ "Over and Out! Shortest Coaching Tenures – George O'Leary: Notre Dame". Daily News. New York. ^ Gorman, Kevin (2011-01-03). "Wannstedt will not coach Pitt in Compass Bowl". Pittsburgh Tribune-Review. Archived from the original on 2011-01-06. Retrieved 2011-01-03. ^ Zeise, Paul; Brink, Bill (2010-01-11). "Pitt's search ends with hiring of Tulsa's Graham". Pittsburgh Post-Gazette. Retrieved 2010-01-11. ^ "New coach Graham: Pitt fans 'won't want to sit'". ESPN.com. 11 January 2011. ^ Glicksman, Ben (2011-05-10). "New coach Graham working to remake Pitt on and off the field". SI.com. Retrieved 2011-08-19. ^ Fittipaldo, Ray (July 18, 2012). "Pitt's move to the Atlantic Coast Conference is now official". Pittsburgh Post-Gazette. Retrieved July 18, 2012. ^ "Todd Graham to coach Sun Devils". ESPN.com. 2011-12-14. Retrieved 2011-12-14. ^ "Keith Patterson Named Interim Coach for Pitt Football". PittsburghPanthers.com. 2011-12-14. Retrieved 2011-12-14. ^ "SMU vs. Pittsburgh - Game Recap - January 7, 2012 - ESPN". ESPN.com. ^ a b "Pitt turns to Wisconsin's Chryst to be new coach". ^ Zeise, Paul (2011-12-23). "Pitt's new football coach Chryst prefers doing to talking". Pittsburgh Post-Gazette. Retrieved 2011-12-28. ^ Werner, Sam (2013-12-27). "Pitt beats Bowling Green, 30–27, in Little Caesars Pizza Bowl". Pittsburgh Post-Gazette. Retrieved 2011-12-27. ^ Armas, Genaro C. "Wisconsin brings Pitt's Chryst home as coach". Yahoo! News. Retrieved December 18, 2014. ^ "Shake-up at University of Pittsburgh athletics: AD Pederson fired as Chryst leaves". ^ "Pittsburgh". 247Sports. Retrieved 2016-11-18. ^ Krest, Shawn (November 17, 2018). "Pitt clinches Coastal Division by cruising to win at Wake Forest". Pittsburgh Tribune-Review. Retrieved November 20, 2018. ^ a b Official 2009 NCAA Division I Football Records Book (PDF). Indianapolis: The National Collegiate Athletic Association. August 2009. pp. 76–77. Retrieved 2009-10-16. ^ "2008 NCAA Division I Records Book, pgs. 76–81" (PDF). Retrieved 2009-01-08. ^ 2012 NCAA Football Bowl Subdivision Records (PDF). Indianapolis: The National Collegiate Athletic Association. August 2012. pp. 71–73. Retrieved 2012-12-28. ^ a b "Pittsburgh Composite Championship Listing: Recognized National Championships". College Football Data Warehouse. Retrieved August 11, 2016. ^ Official 2008 NCAA Division I Football Records Book (PDF). Indianapolis: The National Collegiate Athletic Association. August 2008. pp. 195–196. ISSN 0735-5475. Retrieved 2009-08-19. ^ "Hugh Green". College Football Hall of Fame. Football Foundation. Retrieved 2009-09-04. ^ Humes, Michael (August 20, 2013). ""By the Numbers": Three-Part Look at College Football on ESPN Networks – Part 1" (Press release). ESPN MediaZone. Retrieved August 26, 2013. ^ Zeise, Paul (2003-12-12). "Double Win For Fitzgerald". Pittsburgh Post-Gazette. Retrieved 2011-11-29. ^ "Alumni Traditions: Rub the Panther's Nose". Pitt Alumni Association. 2010-06-23. Retrieved 2011-11-29. ^ 2012 Hyundai Tucson: "Nose Rub" (Television commercial). HyundaiUSA. September 30, 2011. Retrieved 2012-04-28. ^ a b "Pitt Traditions Part of Debut Season at New Heinz Field; Pitt Campaign Chronicle; August 20/27, 2001". Retrieved 2008-08-24. ^ a b c "Pitt Traditions". Pitt Alumni Association. 2010-06-23. Retrieved 2011-11-29. ^ "Giant Heinz Ketchup Bottles Make Their NFL Debut During Steelers-Titans Game; Monday Night Football Shines at Heinz Field". Business Wire. 2001-10-29. Retrieved 2011-11-29. ^ Bennett, Brian (2010). "Big East game-day traditions: Pittsburgh". ESPN. Retrieved 2010-03-04. ^ Rieker, Richard, ed. (November 1983). "Panther turn-on". Pitt. University of Pittsburgh Department of News and Communications. 38 (2): 1. Retrieved November 6, 2016. ^ Gibb, Emily (2010-11-26). "'Sweet Caroline' boosts Brawl". Pittsburgh Post-Gazette. Retrieved 2010-11-26. ^ "Student Organization Resource Center: Panther Pitt". University of Pittsburgh Office of Student Life. 2008-03-06. Retrieved 2008-04-19. ^ Schwab, Nikki (2003-10-24). "Panther Pitt colors games blue and gold with towels". The Pitt News. Retrieved 2011-11-29. ^ "Best Student Sections in College Football: Pittsburgh". ESPN.com. August 15, 2013. Retrieved August 13, 2013. ^ Paths of Glory: The Dramatic Story of Pitt's First Century of Football (video). Wetterau Corporation and Ross Sports Productions. 1990. Retrieved April 29, 2017. ^ Shetler, Matt. "Pitt Panthers Football: Is It Finally Time To Renew the Penn State Rivalry?". ^ "Pitt, West Virginia Renew Backyard Brawl for 2022-2025". 10 September 2015. ^ Keller, Mathew (2005-05-28). "Notre Dame, Big East agree to series of football games". Pittsburgh Tribune-Review. Archived from the original on 2008-06-09. Retrieved 2010-01-13. ^ "Pitt Future Non-Conference Football Schedules". PittsburghPanthers.com. Retrieved 2010-01-13. ^ "Pitt, Cincinnati schedule 2023-24 footballs series". 17 June 2015. ^ Sullivan, Chuck, ed. (2008). Big East Conference 2008 Football Media Guide (PDF). Providence, Rhode Island: Big East Conference. p. 133. Archived from the original (PDF) on 2009-02-04. Retrieved 2009-03-17. ^ Sullivan, Chuck, ed. (2008). Big East Conference 2008 Football Media Guide (PDF). Providence, Rhode Island: Big East Conference. p. 188. Archived from the original (PDF) on 2009-02-04. Retrieved 2009-03-17. ^ "Heisman Trophy: Heisman Winners". Heisman.com. Archived from the original on 2014-08-01. Retrieved 2012-02-06. ^ a b c Sullivan, Chuck, ed. (2008). Big East Conference 2008 Football Media Guide (PDF). Providence, Rhode Island: Big East Conference. p. 168. Archived from the original (PDF) on 2009-02-04. Retrieved 2009-03-17. ^ a b Borghetti, E.J. ; Nestor, Mendy; Welsh, Celeste, eds. (2008). 2008 Pitt Football Media Guide (PDF). University of Pittsburgh. p. 158. ^ a b c d Borghetti, E.J. ; Nestor, Mendy; Welsh, Celeste, eds. (2008). 2008 Pitt Football Media Guide (PDF). University of Pittsburgh. p. 164. ^ a b "Pittsburgh Players/Alumni". Pro-Football-Reference.com. Retrieved 2010-08-09. ^ Schlabach, Mark (2010-05-10). "SEC not alone in elite NFL talent". ESPN.com. Retrieved 2010-05-12. ^ Tuccitto, Danny (April 16, 2013). "Historical Draft Efficiency: College Rankings". Football Outsiders. Retrieved May 30, 2013. ^ Nestor, Mendy; Borghetti, E.J. ; Welsh, Celeste, eds. (2010). 2010 Pitt Football Media Guide (PDF). University of Pittsburgh. p. 194. Retrieved 2010-08-08. ^ Nestor, Mendy; Borghetti, E.J. ; Welsh, Celeste, eds. (2010). 2010 Pitt Football Media Guide (PDF). University of Pittsburgh. p. 186. Retrieved 2010-08-08. ^ "Pitt Panthers Football Schedules and Future Schedules". fbschedules.com. Retrieved May 22, 2017.